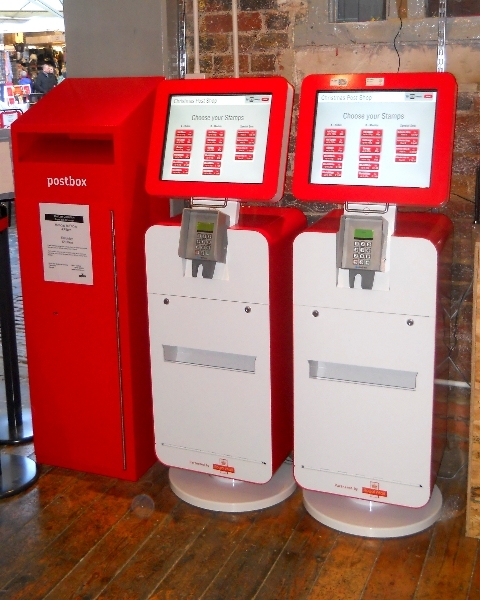 Hytech Machines A3 and A4 Pop-Up in London Post Office with some very exclusive products! 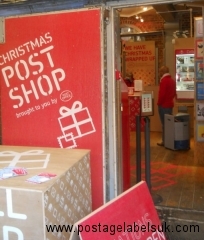 In a new venture for Post Office and Royal Mail, a totally new type of Post Office (Similar to ‘Pop- Up Shops’ previously seen in shopping malls up and down the country at the lead up to Christmas) opened last week in the very busy Camden Market, London NW1. 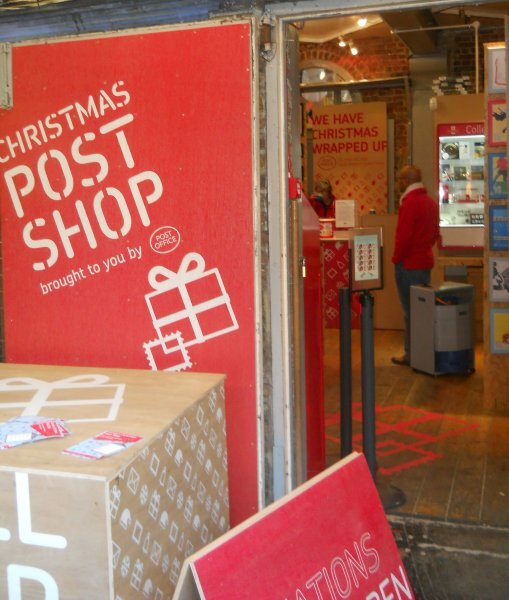 This new branch is called ‘Camden Christmas Post Shop’. 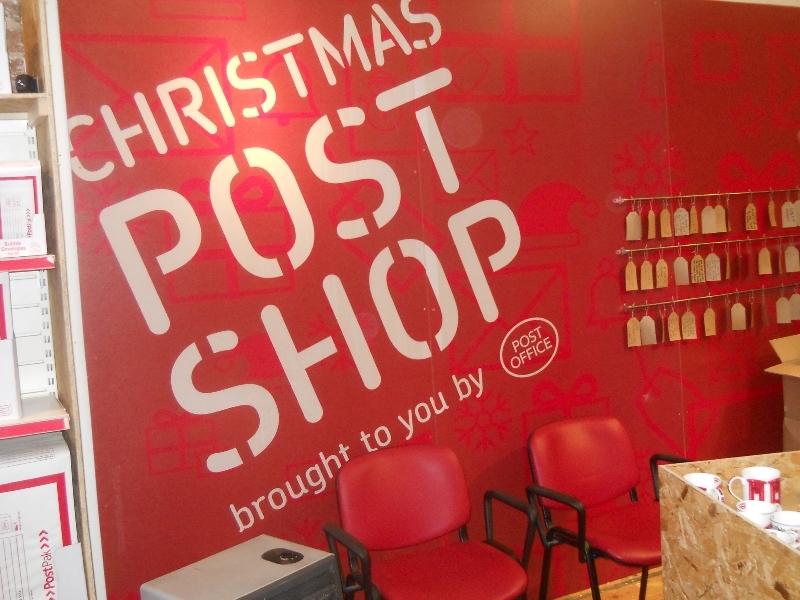 This new outlet is offering selected items from the Royal Mail ‘Collectibles’ range , personalised Christmas 2012 Instant ‘Smilers’ and, more importantly from a Post and Go collectors point of view, it has given rise to the first outing of the brand new Royal Mail ‘Hytech’ Next-Generation machines No. ‘A3’ and ‘A4’. This new branch offers full Post Office ‘Postal’ facilities where purchasers can post their gift items purchased from the shop or elsewhere worldwide. The Post Office is open seven days a week from 10am to 8 pm every day apart from Sundays when it opens at 11am. 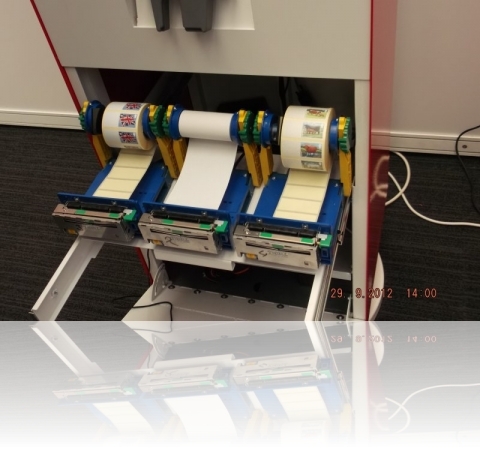 Machines A3 and A4 are visually identical to those previously seen at Stampex – and appear to function the same, although, as they are in a full nolvadex online purchase functioning Post Office branch rather than in an Exhibition setting , they do not have any overprints. It is worth noting that this is the first time Hytech units have been primarily positioned for Post Office customers- posting mail specifically Christmas cards and gifts– and not for stamp collectors purposes. Each of the twin-reel Hytech machines are loaded with Christmas (MA12) Robin stamps as well as Machin Stamps – which for the specialist gives rise to two totally new and exclusive products to this Branch – Hytech Machin ‘Worldwide 40g’ which have not been previously issued, as when un-overprinted Hytech Machins previously appeared at Stampex , the WW40g had yet to be issued. Additionally, this is the only outlet where ‘Hytech Christmas Robins’ (MA12) , printed in strips of six,will be available, (As these are not expected to appear at Spring Stampex 2013). For Postmark Collectors the Datestamps in use at the Post Office are ‘Equipment Team Temporary’ No. ’32’ and No. ’42’. 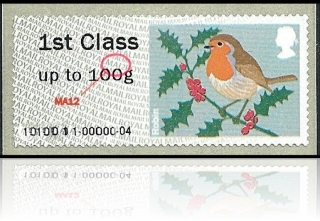 Today the Christmas 2012 Re-issue of the Post and Go Robins have started to appear in Post Office Branches. 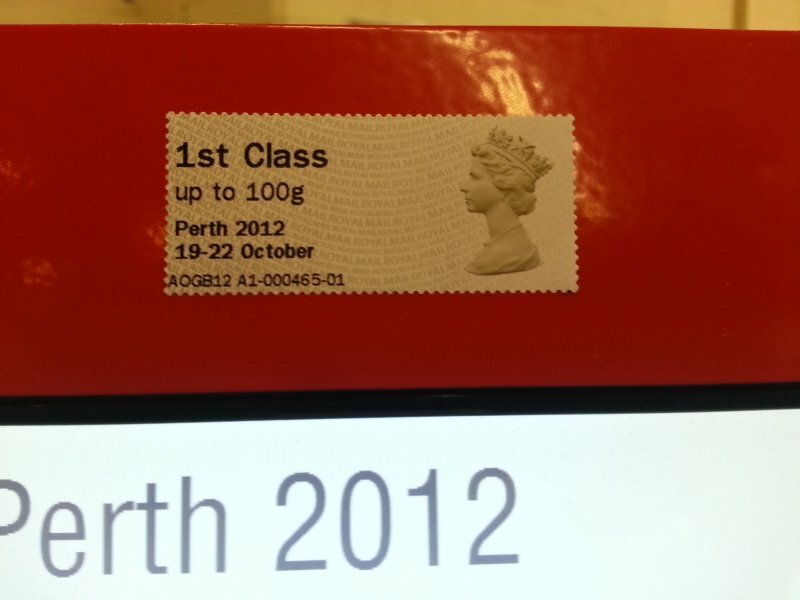 They have, for the first time for Post and Go stamps, a in-built ‘Security code’ to identify them from the 2010 variant and the future 2013 printing. View Post and Go Locations in the UK in a full screen map. View Post and Go Locations in the UK in a text list. Once the Perth Exhibition at the Dewers Centre, Perth had closed its doors the Hytech Next Generation ‘Twins’, machines A1 and A2 were moved to the foyer of the Queen’s Hotel, Perth. The Overprint applied to the Union Flag and Machin head stamps did not change- but the receipt was updated to reflect the new location. 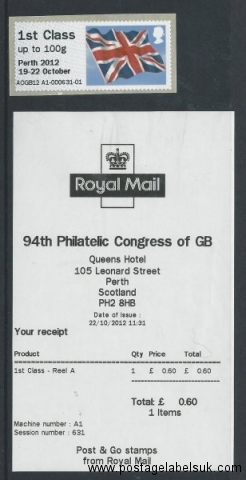 It is understood order nolvadex no rx that there are significantly fewer stamps and strips produced with this receipt and it is set to be a rarity to those collecting the current ‘overprinted’ range of post and go stamps. 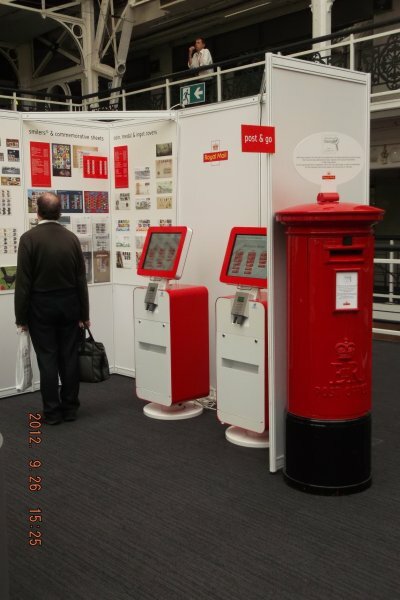 Royal Mails ‘Next Generation’ Post & Go kiosks Numbers A1 and A2, which previously made their debut at Stampex in October, today commenced their tour and were in operation at the first day of the Association of Scottish Philatelic Societies’ National Exhibition in 2012 in Perth, Scotland. No back office facilities ere available for pre or bulk order- the stamps are not available from Royal Mail via Mail Order – the only way of obtaining these stamps was to attend the show. The data string has been updated to ‘AOGB A1-000001-01’ – The ‘O’ representing October . 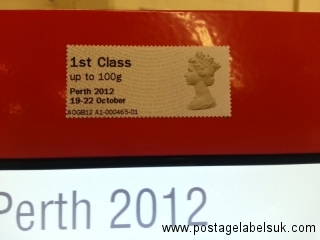 For Autumn Stampex 2012 , Royal Mail unveiled its new ‘Hytech V2’ Hytech Post and Go kiosks. 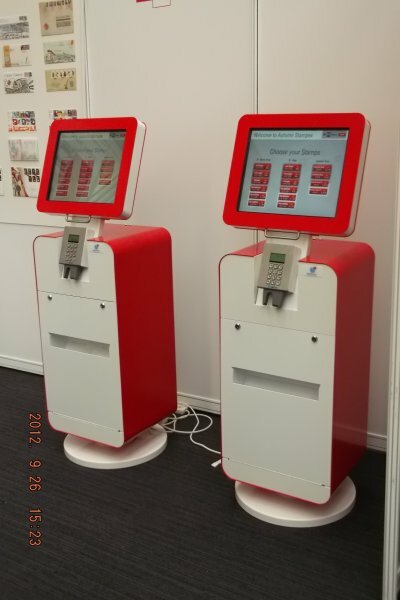 These are the culmination of the various trial and tests carried out over the last four shows has resulted in a new design of kiosk that can be deployed to various locations- shows etc. 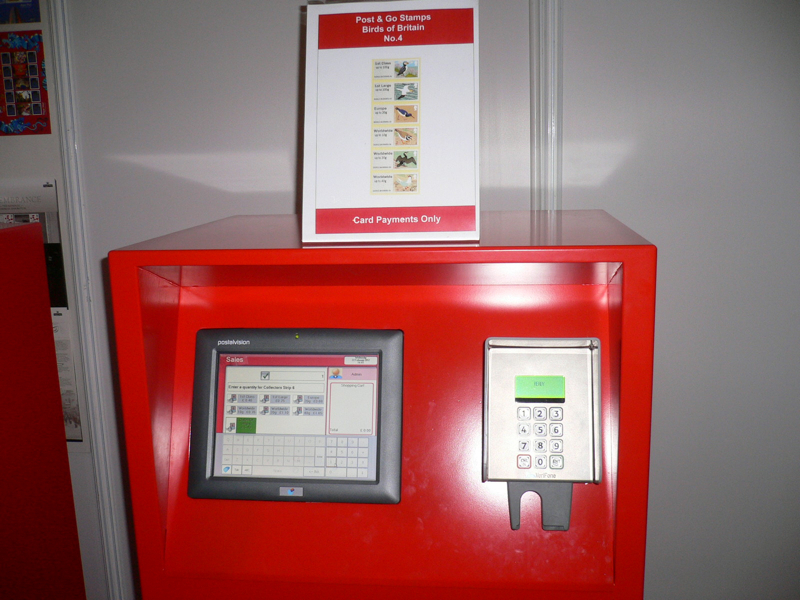 The kiosks were sited at the rear of the hall on the upper level – which did cause some intermittent service problems due to mobile signal strength issues (which these units rely on to authorise card purchases) during the show. As with the previous four Stampex shows, four Hytech machines were in use. 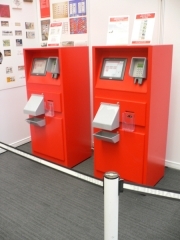 Two reserved for ‘Self-Service’ use machines- which have now been designated A1 and A2, were located on the right hand side of the stand. 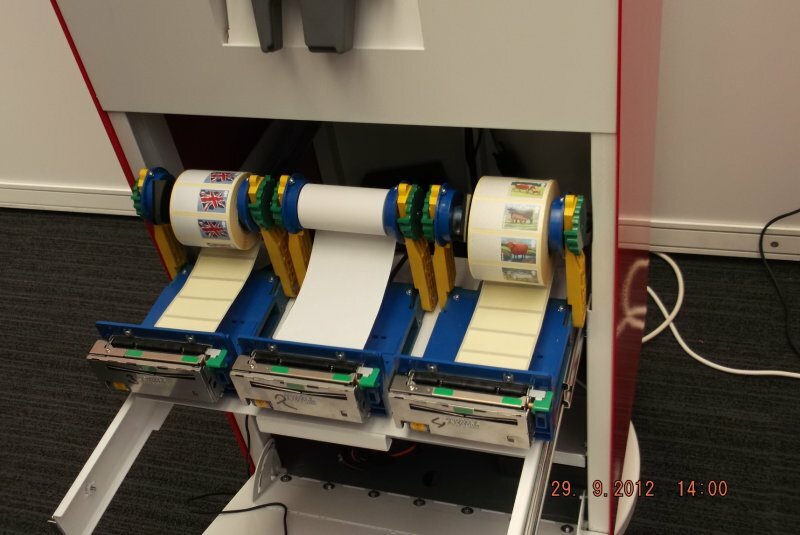 These new ‘V2’ machines are capable of being loaded with two reels labels of two different designs, which could then be be selected by collectors. The interior arrangement of the rolls of labels is illustrated in Fig. 3. 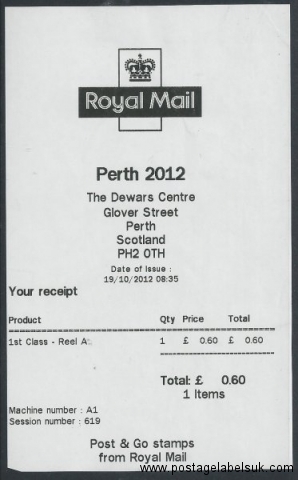 The third, centre roll of labels produced customer receipts. At these machines, payments could only be made using a credit buy isotretinoin online card. This arrangement dispenses of the need for complicated cash and change handling within the machine. Two further machines, designated here as B1 and B2, were located in the back office of the RM stand. Each machine carried only one roll of P&G labels. 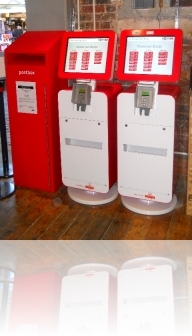 Those dispensed by these machines were sold over the counter by Royal Mail staff. During the period of the show, three different label designs were made available — Pigs, Cattle and Flags. The flag design was formally available with the Diamond Jubilee overprint (but see later). The allocation of label designs to the four machines is given in Table 1 below. Flags Y Y Y ? The content in machines A1 and A2 changed day to day to give maximum opportunity to customers. The availability of labels is shown in Table 2 below. Royal Mail have confirmed that they have completed their trials of Hytech Self-Service equipment and will now introduce a updated and improved set of Hytech equipment. The new machines will include for the first time a ‘fixed’ machine identifier which will link to a ‘series type’ for example the ‘A’ Series will be self-service. This ‘fixed’ identifier will appear on all stamps produced by that machine and will additionally include ‘Location’ as well as the usual Month and Year information. 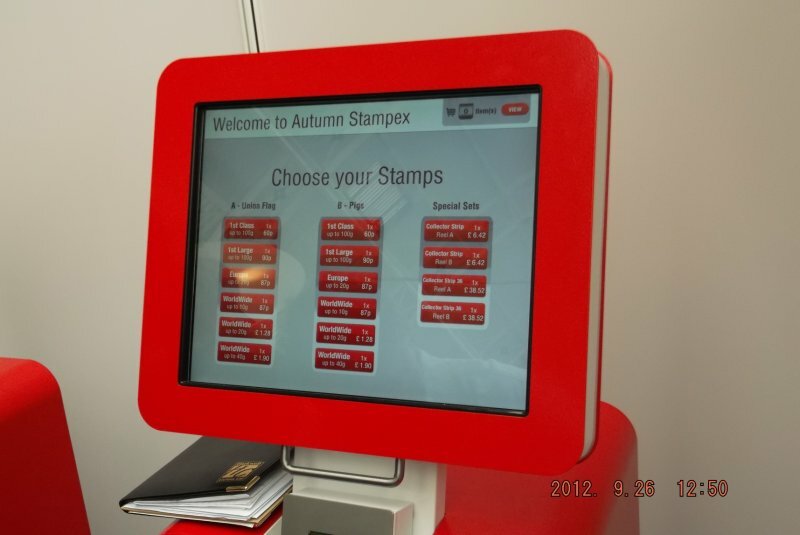 For Autumn Stampex 2012 , there will be Four Hytech machines in use – two ‘Self Service’ and two ‘Back Office’ versions. 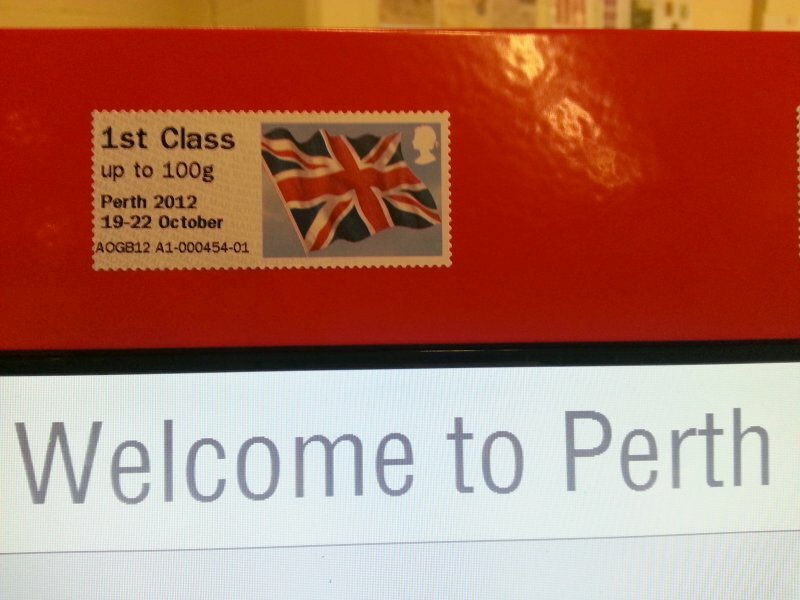 As usual, the current Post and Go issues will be available on the opening of Stampex – Pigs and Union flag . 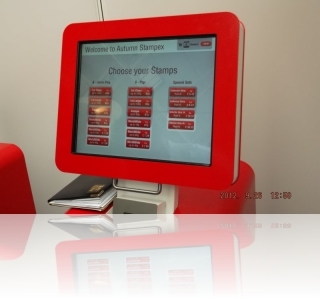 On the Friday of Stampex, The new issue buy nolvadex in australia ‘Cattle’ will be introduced. In addition the ‘Stampex Special’ overprint will be a unique version (only available at this Stampex) of the “Diamond Jubilee” overprint applied to the Union Flag Post and Go stamp. 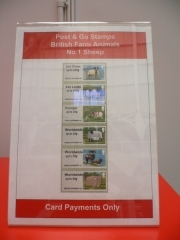 British Farm Animals 2 ~‘Pigs’ Post & Go Stamps. 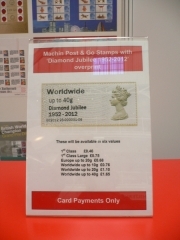 ‘Union Flag’ Post & Go Stamps with ‘Diamond Jubilee 1952-2012’ overprint. ‘Union Flag ‘Post & Go. British Farm Animal 3~’Cattle’ Post & Go Stamps. (Available from 28th September). Which can be vended in singles or multiples as required. 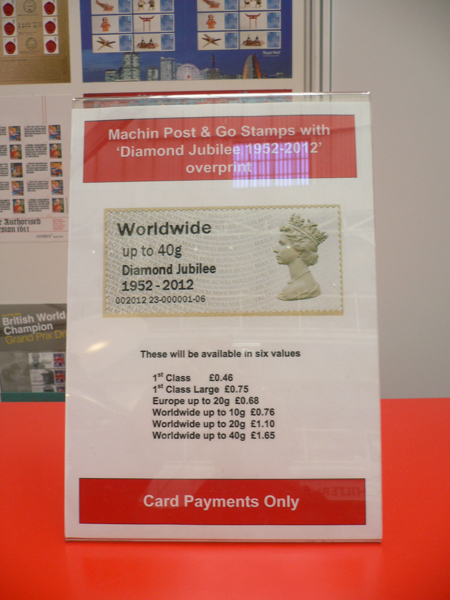 So what was available from Spring Stampex 2012? 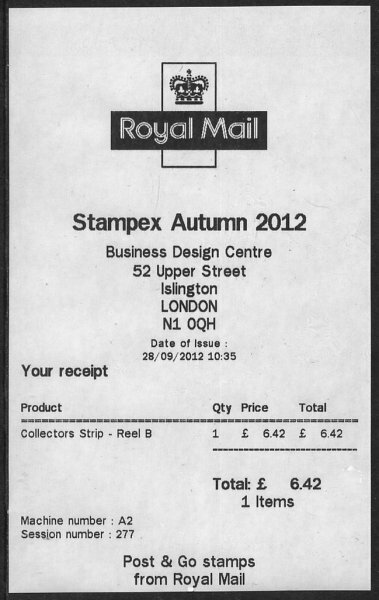 I have had many messages regarding what was available from Spring Stampex 2012. 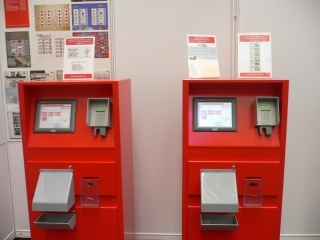 Certainly the Royal Mail stand appeared to be doing a brisk trade in Postage Labels from the now ‘standard’ configuration of two self-service machines (Back in their ‘February’ configuration of Nos.21 and 22) and two ‘back office’ machines (Nos 23 and 24). Wednesday started off with the left hand self service machine (No. 21) dispensing the ‘Diamond Jubilee’ overprint – and this continued until the close of the show uninterrupted. This was mirrored in the back office by machine (No.23) for the first day of the show. 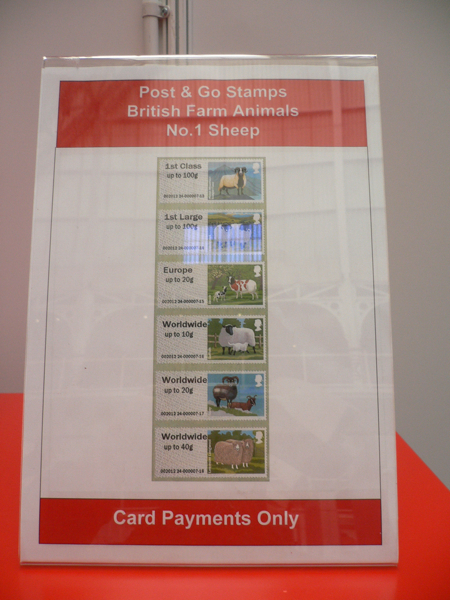 The right hand self-service machine (No.22) was fitted with ‘Birds 4 ‘ stamps (as the current issue) until Friday where it was (as the first day of issue) replaced by the new ‘Farm Animals- series 1 – Sheep’ stamps. Therefore Sheep stamps exist from machines 22, 23 and 24. 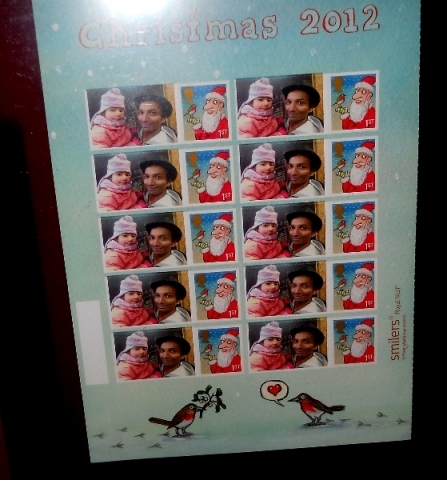 Birds 4 stamps exist from machines 22 and 24 only. The back office machines produced collectors sets of 36 (6 x 6 ) or collectors strips of 6 for the Birds and Sheep issue or collectors strips of 6 for the Diamond Jubilee overprint. The self service machines had been modified to prevent ‘pulling’ by some collectors/dealers to manufacture their own ‘varieties’- this appeared to be successful and although the odd ‘hiccup’ was noted where misprints did occur- those that did were ‘real’ ! were ready on first day- in these cases the receipts will show the FDOI. The latest update to the Wincor Post order nolvadex & Go software has been activated at a single branch (Broadway, London SW1) on Thursday 13th October 2011. This upgrade allows customers to post Recorded Signed For, Special Delivery, Airsure and International Signed For Royal Mail products as well as Parcelforce Express items within the UK and to the EU. 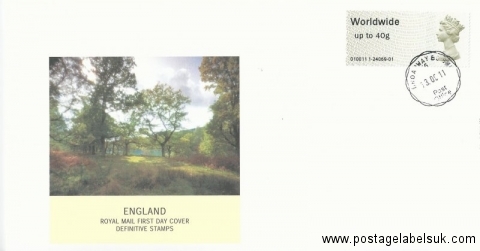 For Post & Go stamp collectors a new value of 40g Worldwide becomes available from the ‘Buy Stamps’ menu as well as a facility to purchase the whole six values, dispensed in two strips of three. 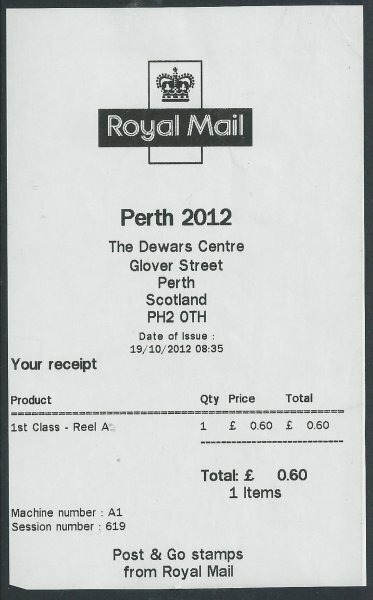 On Monday 29th September 2011, two new ‘accounting codes’ were added to the existing printed overprint applied at the time of posting to the Horizon label. These codes are solely for the easy identification of the VAT rate/ product combination for each label, where a subsequent refund has to be made, ensuring any VAT is accounted for correctly. 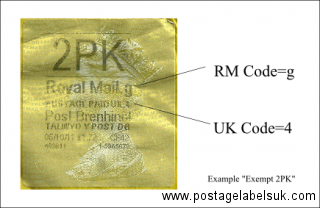 There are 33 different “Royal Mail” codes and 4 different ‘Parcelforce’ codes- the table below shows the different codes that apply to each Label Identifier. 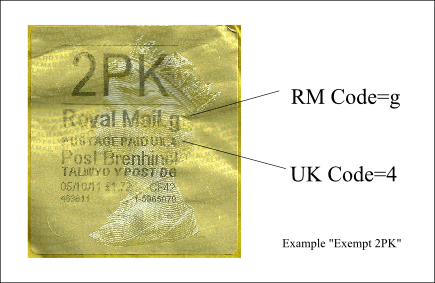 The ‘RM/PF ‘ Code maps to the Indicia- The ‘PPUK ‘Code maps to the VAT Rate. How do I work out what VAT is applicable to my item? The applicable VAT rate for a particular postal item is determined by its destination. any ‘Add-ons’ are applied (Such as Saturday Guarantee) plus Airsure and Parcelforce “Express” services. Outside of the EU then items are ‘Zero’ rated (including the Channel Islands).